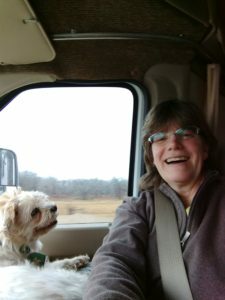 Our day started early morning having coffee in the motorhome while boondocking at a Cracker Barrell in Russellville, Arkansas. We had dinner there last night and hit the sack early. We had put in 502 miles so we were ready to call it a day. The weather report for Oklahoma City and surrounding areas is still not looking too good, but the storm is supposed to be done with the freezing rain by 1 pm. To delay our departure we decided to stock up on a few things at Walmart. Water was number one on the list. We brought water in 1 gallon containers and only have 1/2 gallon left. Of course, we got some other things while we were there. We should tell you that 6 am on a Saturday is a great time to do your Walmart shopping! The store was virtually empty! After putting all the groceries away we hit the road. 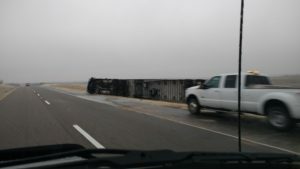 I-40 West – here we come! One of the apps that we find very useful is called the Rest Stop Locator. It tells you the rest stops in each state and whether they are actually open or closed. We found that several rest stops this trip are being renovated and are closed. The states had the gall to close two rest stops in a row! 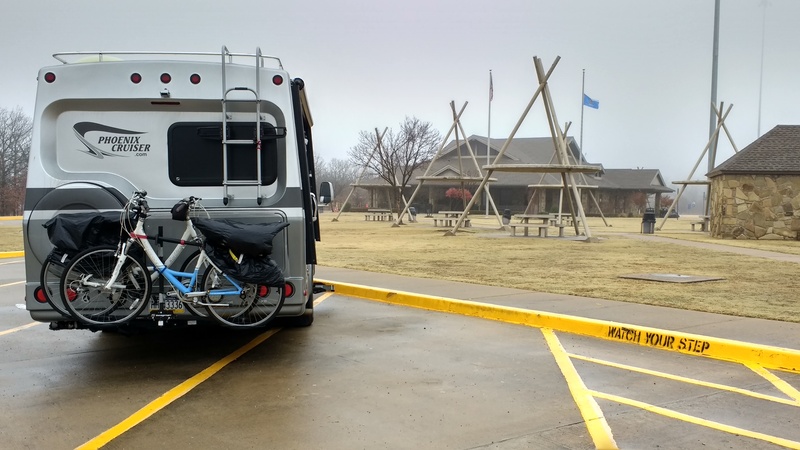 The first time we used the app this morning was to research a rest stop to have breakfast and we stopped at the Oklahoma Welcome Center. It was one of the nicest rest areas that we’ve ever stopped at. 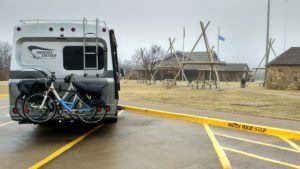 It had nice displays on the history of the Trail of Tears, some information on Route 66, clean restrooms, an RV dump station and free coffee! We learned that there are 39 Indian tribes in the state of Oklahoma. The 3 senior ladies at the visitor center gave us the latest info on the weather including a number to call for road conditions. 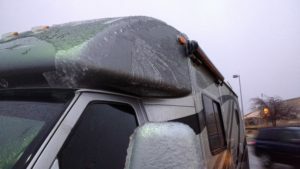 They pulled the weather report up on the computer and showed us that by the time we got to the area, a good 2.5 hours, we should be OK. We also got some history on the Indian tribes and the fact that they are trying to buy back their tribal lands. The lady then said, “You can go to Walmart if you want to see the real natives and the rest of us.” LOL. Bless her heart. We took our coffee to the rig and had a lite breakfast. Miss Heidi had a nice walk and enjoyed sniffing around. She loves stopping at the rest stops. The weather forecasters were wrong, like they are 50% of the time in my opinion. 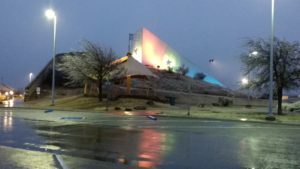 When we got to Oklahoma City it was still raining and every now and then there were ice pellets. It has been raining the entire day and we constantly have to adjust the wipers from a slow beat to super fast. 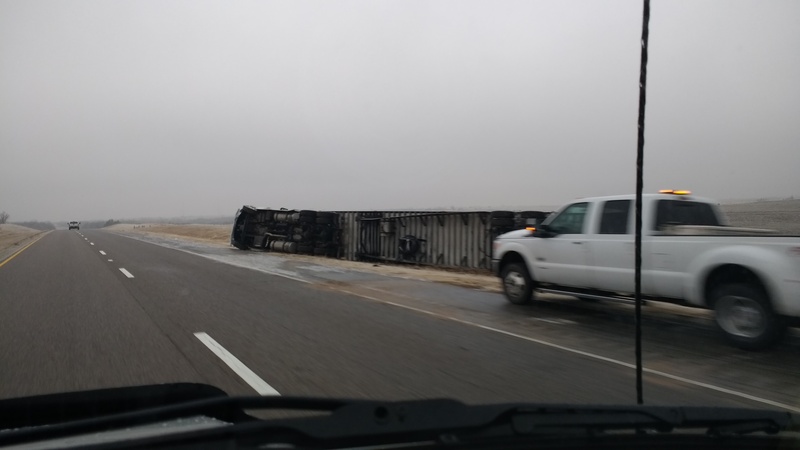 We definitely believe we missed the brunt of the storm as we saw 3 tractor trailers on their sides in the ditches. 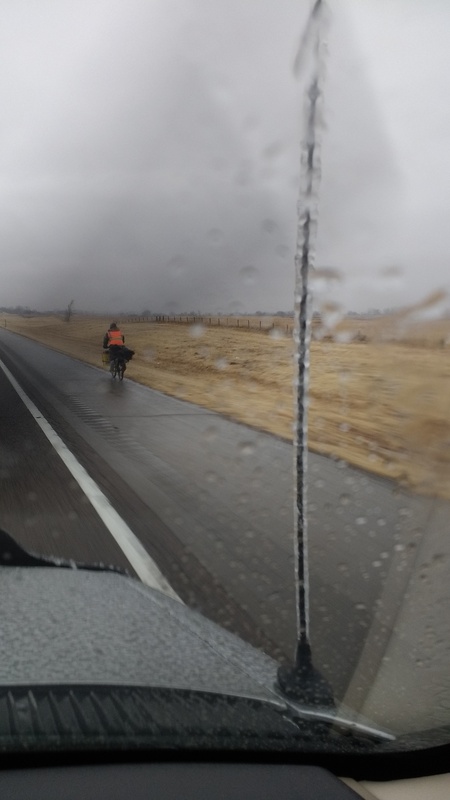 We couldn’t believe it but we saw a man riding a bicycle in the freezing rain on I-40. His bike is fully loaded – we wonder what his story is. Would you want to be riding in this? Poor guy! As we drove down the highway, chunks of ice kept blowing off our cab whenever a tractor trailer passed us. It was a stressful trip. 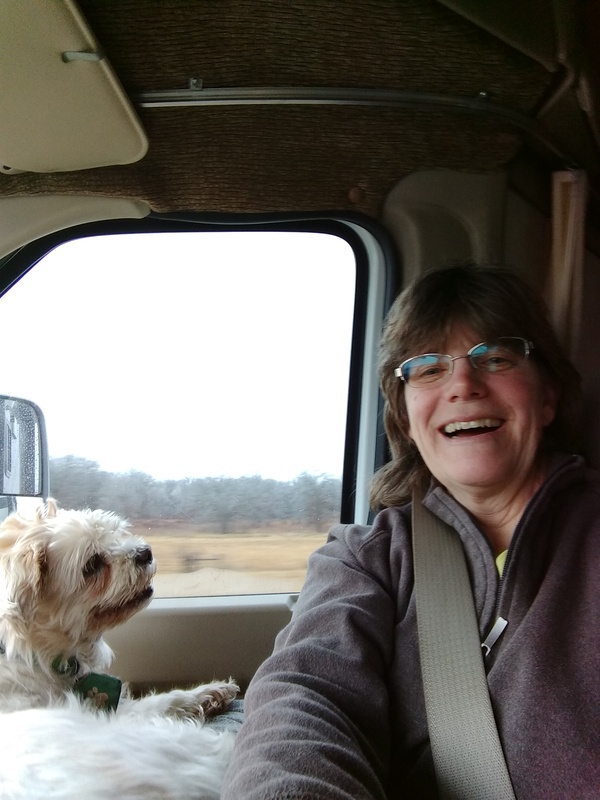 Even Heidi wanted to check on the road conditions! Heidi provided us some stress relief! Thankfully we made it safely to a rest stop in McKean, Texas. It was rather crowed with trucks, cars and RVs. Notice that the cap of the rig is covered in ice. It was a beautiful rest stop, but we didn’t get to check it out because of the ice storm. Instead we opted to stay inside our cozy rig. Another long 10.5 hour day with 465 rigorous miles! This entry was posted in Arizona, National Parks and tagged Heidi, Quartzsite, Winter Travel. Bookmark the permalink. Stay safe! What an adventure! Thanks, Barb. We’re trying our best. Safety is our number 1 priority! Congrats on the birth of your grand daughter! Enjoy your time in Florida.